BeenThere-DoneThat: The South Downs Coast, Sussex. 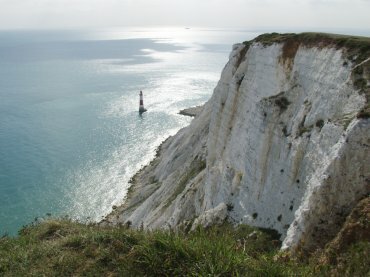 Beachy Head and the Beachy Head Lighthouse seen from the east. If you look carefully at the cliff face, especially in the larger view, you may notice some thin dark stripes. These are rows of flints embedded in the chalk. 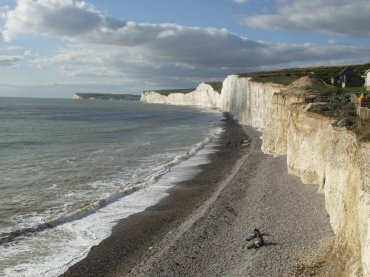 The Seven Sisters chalk cliffs stretch away from the camera at Birling Gap towards Cuckmere Haven with Seaford Head jutting out on the horizon. The tide is starting to go out and the high tide mark can be seen where the dark shingle changes to light. The cliffs at Birling Gap are only about 30 feet high, hence the 'Gap', and there is a metal stairway down to the beach. This view is from the top of that stairway. 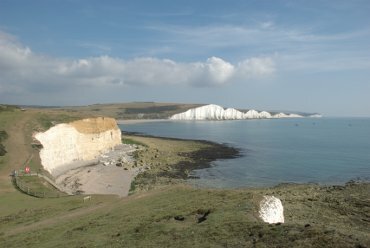 The Seven Sisters chalk cliffs and Coastguard Cottages from Seaford Head. The beach at the foot of the cliffs on the left is Cuckmere Haven. On the horizon near the right-hand edge of the picture is the Belle Tout Lighthouse sitting on one of the cliff high points just beyond Birling Gap - the lowest point in the cliffs. The remarkable feature of these cliffs is that they have a distinctive undulating appearence with seven rounded summits - the Sisters. This has made them an unmistakable landmark for generations of seafarers. 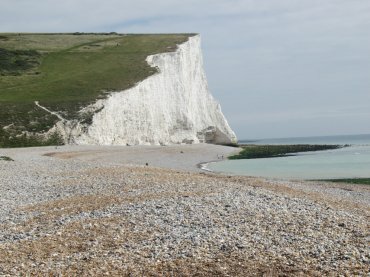 Cuckmere Haven and Haven Brow - the first of the Seven Sisters chalk cliffs. The figures on the beach in the distance, and those on the top of the cliffs, give an idea of scale. 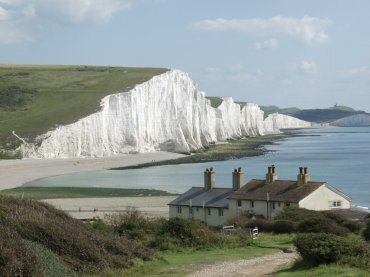 The view from Seaford Head looking across Hope Gap to the Seven Sisters.